Attractive and practical, islands make for versatile surfaces, natural gathering spots, a home to appliances and extra storage and the perfect place to stage a buffet, all while serving as a kitchen’s focal point. Photo courtesy of hikesterson / iStock / Getty Images Plus. At a recent party, the center of action was the kitchen island. An assortment of cheeses, prosciutto rolls, salami, spreads, red grapes, coconut shrimp with mustard dip, giant green olives stuffed with blue cheese, and crackers displayed on platters and an aluminum ice tub filled with bottled and canned drinks lent a lively atmosphere for conversation and a surface for tiny plates, forks, napkins and glasses. Because the island is usually at the center of kitchens, it serves as a focal point not only for entertaining but for homework, bill paying, food preparation, storage and eating. It may serve as the drop zone for backpacks, handbags and briefcases. Islands provide versatile counter space and maybe a small sink for drinks and clean-up separate from the main kitchen sink. There may be shelves for easy access to cookbooks and dishes. If there are bar stools or raised chairs, it can serve as a coffee bar for light breakfasts and lunches. Picture kids doing homework or coloring, parents sorting mail or wrapping gifts or other activities. At my house, I have a friend who perches on a black bar stool every holiday and declares it her chair — from there, she watches all the action. She says if I ever get rid of that chair I’ll be in trouble. People think of their islands as friendly, dependable, functional places. Type and sizes range from carts and utility tables on wheels to custom permanent installations up to 10 feet long with granite, marble or quartz tops. Granite installers and builders call them something unprintable but let’s say big-as-can-be islands. Too big can be a problem if it overwhelms the space and makes getting around the kitchen to the refrigerator and sink difficult. Ultra-modern homes are likely to feature commercial-grade stoves and, along with them, waterfall style kitchen islands, that is, islands with countertop material running down the sides. When large islands open directly onto living or dining rooms, a complementary finish is important. Height options are table, bar or counter height. Regarding seating, think about adjacent spaces. If you have a dining room right there or a sit-down kitchen table, chairs at the island aren’t so necessary. Think about how your family likes to eat and move around the kitchen. Stools can be placed underneath to conserve walking space. About storage and design, islands can have a microwave oven at one end and spaces all around for drawers and small appliances like KitchenAid mixers. They can be subdued and blend in with the rest of the kitchen or make a bold statement with a different color such as red, dark blue, gray or made of dark wood as a contrast in an all-white kitchen. The islands can be considered furniture with exquisite cabinetry. Countertops can be the same or markedly different from the rest. 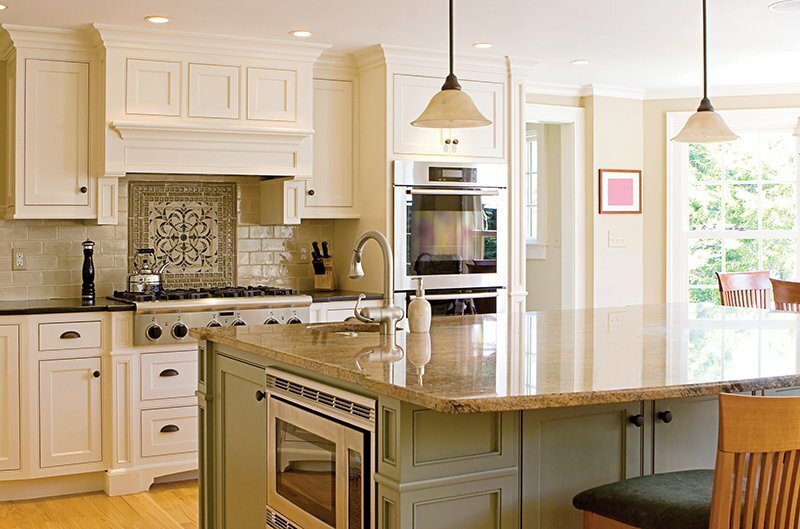 So, to add style, efficiency and storage to your kitchen, consider an updated island. Maximize your storage by carving out more cabinets and display space. Invite folks to grab a plate or pull up a chair and enjoy.